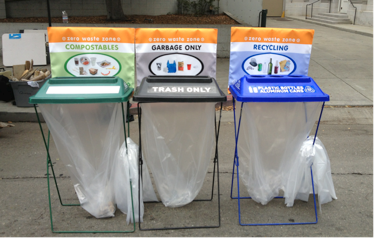 The City of Oakland Recycling & Solid Waste Program implements the City’s Zero Waste policy goal through programs, planning, technical assistance and education to reduce, reuse, recycle and responsibly manage solid waste from Oakland residents, businesses, events and construction activity. For current information on Compost, Recycling, Trash, and Bulky services for Oakland residents, visit our residential program website, OaklandRecycles.com. Use OaklandRecycles.com to find out what goes where, pay your bill, request new service or make changes to existing service, learn about upcoming events, see current rates, or contact Customer Service. For additional information about rules and requirements affecting Oakland residents, see Frequently Asked Questions for Residents or Frequently Asked Questions for Oakland Multifamily Property Managers. For current information on Compost, Recycling and Trash services for Oakland businesses, visit OaklandRecycles.com/business. For additional information about rules and requirements affecting Oakland businesses, see Business Requirements & More Information For Businesses. 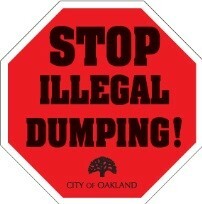 Contact the Oakland Recycles hotline at (510) 238-7283, or via email, recycling@oaklandnet.com. Recycle Where? is a project of San Francisco Bay Area counties, cities and agencies. 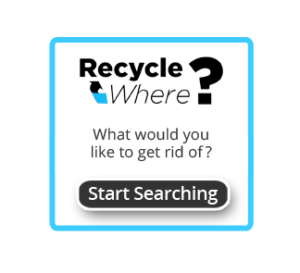 Enter the item you would like to get rid of, your City or Zip Code, and your building type (Single Family Dwelling, Apartment/Multi-unit, Business), and learn how to recycle or dispose of your item. Cooking oil and grease poured down drains builds up in pipes causing backups. Proper disposal of your cooking oil and other greases and fats will help prevent a sewage backup in your business or residence. Overflows can pose health and environmental hazards, polluting local creeks and San Francisco Bay. On our Zero Waste News page, you can find the complete history of procurement of Zero Waste services in Oakland, including links to policy documents, staff reports, Council action, and contracts. It takes resources and energy to manufacture and transport all products, including recyclables. So cutting down on waste disposal through Reduce and Reuse activities provides more economic, social and environmental benefits than recycling and composting alone. A Sustainable City means making our City safe, healthy and vibrant with opportunity and well-being for all — while acting within the capacity of natural systems. Learn more about waste reduction and the four R's. Single-use bags—whether paper or plastic—create waste and litter and contribute to greenhouse gas emissions. Learn more about our Bring Your Own Bag Campaign. Unwanted mail and catalogs clutter homes, and every year the paper industry cuts down 100 million trees in the U.S. annually to produce it. It’s good to recycle your junk mail. It’s even better to stop getting it. We have more information to help you reduce your unwanted junk mail. Oakland is working passionately toward becoming a Sustainable City—a place where we can meet our current needs while ensuring that future generations can live rewarding and healthy lives. To learn more about the strategic plan to make Oakland waste free by 2020, click here.